A historic town …and a shopping heaven! Pontivy, a large and lively market town in the Morbihan department of Brittany, is a town made up of two distinct halves. There is the intriguing mediaeval area which centres on the 15th century Chateau des Rohan, which is a fabulous moated castle. Here you can see the Napoleonic influence in streets that are laid out in regimental lines. Then there is the area known as the old town, with its beautiful timbered buildings that overhang the quaint little streets. Here you can shop 'til you drop, and rest assured that it will be a thoroughly enjoyable process! Remember to take a walk up the little winding side streets too, as some of the best shops are hidden away in this fascinating part of town. If you are in town on a Monday morning be sure to go to the market, which is a regular and important feature of life in Pontivy. Even if you don't want to buy anything (although with the plethora of colourful goods and produce on offer it would be surprising if you didn't) the market is a wonderful place to watch a slice of real French life unfold. The countryside near Pontivy is lovely, with the usual Breton selection of picturesque villages, rolling fields, rivers and forests to enjoy. The River Blavet flows gently through the area, and is bordered by some truly beautiful villages where you can sit at a table and eat while you watch the boats go through the locks. It is also possible to take a trip on a boat yourself, and some of these are floating restaurants for a really romantic dining experience. 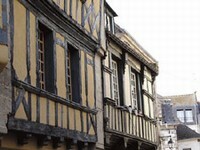 The region is rich in history so there is much to discover, and those who are of a sporting nature will enjoy the many activities that are available close to Pontivy. Pontivy is also a great place to visit in the winter, as with its location on the western side of France it benefits from what is known as the 'gulf stream effect', meaning it enjoys milder winters than even the south of France. Fly into Brittany's airport of Dinard with budget airline Ryanair, or take a ferry to any one of the northern French ports (St Malo and Roscoff are the nearest of these). There is also a train station at Pontivy, making rail travel another possibility. If you are house hunting on a budget you have really come to the right place. Property in this area, the northern part of Morbihan, is amongst the cheapest in France, and that doesn't mean you have to compromise on choice or quality! There are a remarkable variety of properties on offer here, at some truly unbelievable prices. The only catch is, it can't last forever - so what are you waiting for? 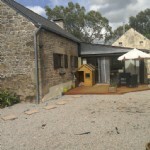 Do you know Pontivy better than we do? Do you have photos of Pontivy? 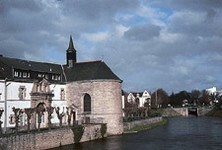 Pontivy is situated in the heart of Brittany, in its southernmost department of Morbihan, in north-west France. Access: By ferry to St Malo, Roscoff, Cherbourg, Caen or Calais.By air to Dinard. Interesting fact: Pontivy gets its name from the French word 'pont' meaning bridge, and the name of a monk , Brother Ivy, who built a bridge there over the River Blavet back in the 7th century.